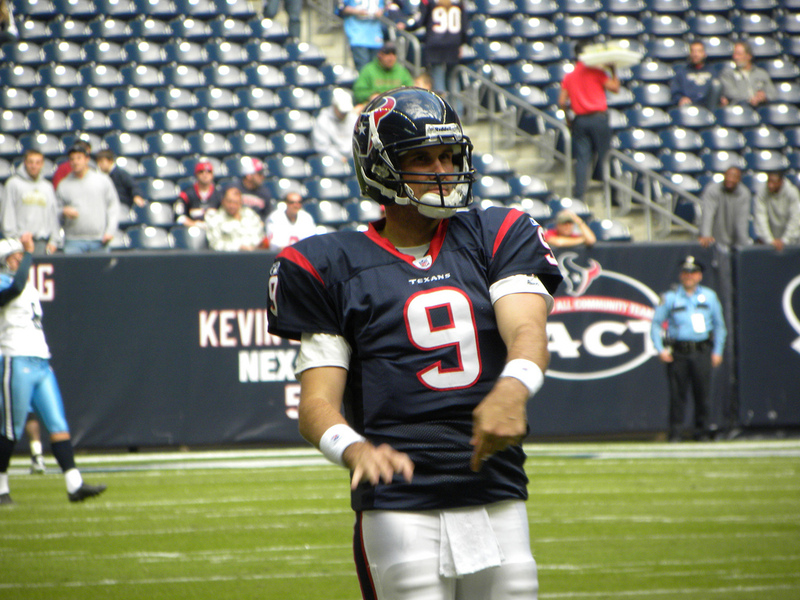 Why is QB Matt Leinart an example of the "Four-Car Garage Theory?" National Football Post Director of College Scouting Wes Bunting explains in this conversation with Matt Waldman. Photo by TheBrit_2. Waldman: Let’s talk about college football since the draft is your baby at the National Football Post. Tell me about some skill players that are not headliners, but they are prospects that those of us who follow the NFL Draft should become acquainted with. Bunting: Running back Doug Martin from Boise State. Everyone is talking about that kid from A&M (Cyrus Gray) and Isaiah Pead from Cincy and even Boom Herron from Ohio State. I think Doug Martin is by far the best. He’s a thicker back and his burst and initial quickness is really impressive. He doesn’t have elite straight-line speed but he plays extremely quick and he accelerates extremely well. He reminds me as a runner as a little more explosive runner than Shonn Greene coming out. Greene was shifty, but only had a slight burst and one gear. Doug Martin is a more dynamic version of Shonn Green as a prospect. I think he’ll go in that third-round range, but I think he’ll come into a camp and become a starter in the NFL. Bunting: I really like (Texas A&M QB) Ryan Tannenhill, but people are already talking about him a lot. I was a fan of the quarterback at Oklahoma State( ). His name slips my mind, but he was a big baseball player and he’s 28 years old. He can spin the football and the one thing that’s overlooked is that he’s a mature kid – granted he’s old – but he’s a mature kid and he’s been a professional athlete and he knows how to handle himself. Give this guy some more time. If Derek Anderson can play on an NFL roster and even start in the league then certainly this guy can. Physically he’s a more athletic guy. He’s much more coordinated than some of these 6’6” guys – the John Skelton and the Derek Anderson’s of the world. He can end up being a solid starting quarterback in the NFL. Granted he won’t take over until he’s 29 years old, but he could start for 5-6 years and make a team happy with a third-round pick. Waldman: This has to be the most common question I’m asked…What do you think of Andrew Luck? Wes Bunting and I agree that Andrew Luck is one of the best pro quarterback prospects ever. Photo by RBrown23. Bunting: Ohhh…he’s…I wrote this last year. I can actually request some old school tape and I had to get ’98 Peyton Manning tape because I’ve never seen a guy as Andrew Luck, ever. Granted that’s ninth grade for me, but even Peyton as a senior isn’t as good as Andrew Luck from the shoulders up. Watching Luck go through reads is impressive. Against Virginia Tech they come out in either a heavy or jumbo. Stanford had a number of tight ends and Luck shifted all three to the opposite side and they split out either into a pro package or some type of package where the tight ends and the full backs split out. And Luck goes across the field and finds the third option – the tight end on the near side – and completes the pass like it was nothing. The athletic skill set is there, but it’s just his ability to decipher information and have that understanding of the offense that is second to none. It’s just the little things like all the shifts, where he puts them in a completely new formation and he can still go through a progression and hit the guy on time in the third progression. You don’t see that from anyone. Peyton Manning or Tom Brady in the NFL? Yes. But you don’t see it from college players. Waldman: I wrote a long analysis at Footballguys.com about similar things. Jim Harbaugh said Luck was the best quarterback prospect in decades and I couldn’t find anything to disagree with him. Bunting: Yeah, it’s funny because if you even get a chance to see early highlights of Peyton Manning you’ll notice that he’s matured so much that he can just dominate. He makes college mistakes in those early highlights. But you don’t see any college mistakes from Andrew Luck. He’s very good. He’s about as good of a prospect that I’ve ever seen at the quarterback spot. Waldman: Any freshmen or sophomores on the college scene who have really caught your eye and you want to see more of them? Bunting: (Marcus) Lattimore, the kid from South Carolina. I haven’t seen tape of him, but I’ve seen him on TV but he’s talented. Kenny Stills from Oklahoma. I think he’s a shiftier as a freshman than Ryan Broyles was as a junior. They’re both intriguing and there’s no doubt about it that they have futures. Riley Reiff from Iowa, the left tackle there is another very good player. Iowa loves to make those three-star, 6’7”, 260lbs. tight end prospects put on 30 pounds and turn them into first-round offensive tackles. I think Riley Reiff is going to be that net guy. Waldman: How tied into you are to college recruiting? Bunting: None really. I will look up the two-, three-, four-, and five-star prospects, but it’s just to see who they are. We see guys every year that are really talented, but never puts it together and I want to see if he was a five-star prospect. I want to see if he was considered to have that type of skill. It’s the four-car garage theory. You grow up and you have four cars in your garage you’ll never work for anything. Three, probably not; two, you have a chance; and if you don’t even have a garage you’re going to work for everything and do everything that you can to succeed. These five-star guys all come from that four-car garage. They were given everything and they were always told how great they were and therefore never had to work for anything. When they get to the NFL and they actually have to work or sometimes even the college level you’ll see them react like, wow this is hard, forget this – just give it to me. And no one hears from them anymore. Matt Leinart was a great example. Everything was given to him. Waldman: I studied Leinart the first year I wrote my publication and the biggest thing that impressed me watching Leinart was his receiver Steve Smith. Waldman: Bailing him out left and right with all the NFL-caliber receptions he made on NFL-caliber routes.What does evaluating a player on film entail for you. If someone could watch your daily work life what would they see? Bunting: I’ll tell you what I’m doing tomorrow. I have to watch a big ACC team. I’m going to wake up around 7:00-7:30 a.m. I’m going to check my fantasy baseball squad and see how they’re doing while I wake up a bit. Then at 7:50 a.m. I’ll pick a team like Florida State to watch. They have a couple of tackles I want to see so I’ll look at the grades from B.L.E.S.T.O. and National and then I’ll look at all of the senior prospects on that team. I’ll put down their name, height, weight, and number. Then I’ll start on the offense. I’m ADD so I’ll need to start with one player at a time. I’ll start with the highest skill position players. If they had a quarterback I’d start with him and watch a game to a game and a half. With tape, that’s about three hours to get through a game or a game and half. I’ll take down an occasional note by hand, but I can keep it all in my memory for what I want to put together. I’ll take about three minutes to gather my thoughts after I finish watching the player and then I’ll put it all down on paper. That takes me about an hour per player. For the big schools I’ll watch four in the morning, take a break around 11 and do some kind of work out and get some breakfast or brunch. Then I’ll go back around noon and watch the defense until about 4:00 p.m. and call it a day. Once I get to 4:00 p.m. I get a little loopy and my evaluation goes kaput. Waldman: Which position would you say is a tough one to evaluate besides quarterback? Bunting: I would say defensive secondary. For me personally, safety is the toughest overall. Obviously you can get guys like Taylor Mays who you can see a mile away. I was a big Jaiquawn Jarrett fan. I looked at the tape and I gave him pretty much a second-round grade where he went. I was at the Senior Bowl and saw him live. Then at the Combine he ran a 4.6 and I tried not to kill him too much so I lowered him to a potential starter, which is a third- or fourth-round grade. The Eagles took him in the second and I watched him play preseason football and he looked like a guy ready to start and I was kicking myself because on tape I really liked him. The same thing can happen where you really like a safety on tape and they end up falling three rounds. It’s not so much about evaluating the players as much as gauging where they are going to go. I think that’s the toughest position to evaluate. 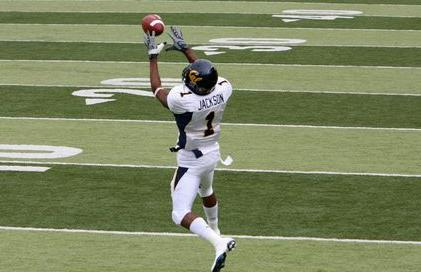 DeSean Jackson is an example of a receiver whose extraordinary skill sets make up for the fact that he's not a complete receiver in the classical sense. Photo by Avinashkunnath. Waldman: Are there other positions where you feel players can make the transition to the NFL and perform well despite having limitations to their overall game? A good example would be Mike Wallace of the Steelers. The team asks him to do certain things well on the perimeter but they aren’t going to ask him to run a lot of inside breaking routes. The same with DeSean Jackson – they do what they do extremely well, but they aren’t asked to do certain things. Bunting: I think the other position like that is linebacker. You talked about about the hybrids and 34 rush guys as opposed to the hand on the ground guys. You have the Jack ‘backers the 34 guys as opposed to your strong side. You have your MIKE that plays on the weak side. You have your designated pass rusher. You have your nickel guy. Brian Rolle could be one of them. Just because you can’t play one of those starting spots doesn’t mean you can’t find a niche in the NFL as a linebacker. You can also play special teams. If you can play special teams you can play in the NFL for 10 years. Waldman: You had a chance to do some work with the Ravens. If you had a chance to improve the NFL’s scouting process based on the experiences you’ve had and the people you’ve talk to, what would you do? Bunting: The decision makers I think need to be more responsible for going deeper in their evaluation process. When you have a GM that makes a decision it’s really tough for him to see all 300 players. The GM is the one that has his neck on the line and he’s the one that gets fired for the picks so he wants to have a say. But I think as a whole there a lot of people that talk about scouts not being able to evaluate when they actually can. They’ve seen these guys for four years in their territories. They know whether he’s a pretty good player or not, but they aren’t the decision makers. I think a GM or the team’s decision maker would be better served if they leaned on their scouts a little more on late-round picks when they don’t have a lot of knowledge about a player after round five. Then they won’t pass on so many free agents who make the Pro Bowl every year.